The active M&A market for mobile gaming has placed emphasis on reaching massive user base scale: the largest mobile games command install counts in the hundreds of millions, speaking to a need for marketing strategies that exceed the per-user focus of performance marketing and have the potential to reach mainstream mobile phone users. Performance user acquisition, in the context of freemium mobile, refers to ad units served on mobile that prompt a user in one app to install another app. Performance user acquisition is the strategy of choice for mobile game user base growth, but the successes of King’s Candy Crush Saga and GungHo’s Puzzle & Dragons – both of which boast massive user bases and employed television advertising in assembling them – have catalyzed a bout of soul-searching within the industry in terms of when and how brand marketing should be incorporated into a mobile game’s advertising mix. Brand marketing for mobile gaming will unquestionably become more important as mobile gaming becomes even more commonplace. But the rise of brand marketing for mobile games doesn’t spell the end of performance marketing. Instead, as mobile games creep further into the daily habits of mobile phone users, both forms of marketing will increasingly become relied upon by developers. Brand marketing, then, can be thought of as the set of campaigns that tell those stories – that define the narrative in which a particular business holds the starring role. The purpose of brand marketing is to keep a brand at the top of a potential consumer’s mind so that, in a purchasing context – for example, when standing in front of a row of essentially identical choices in the soap aisle of a supermarket – the consumer will gravitate (subconsciously) to that brand’s products. The largest consumer goods companies spend lavishly on brand marketing. In 2012, Procter and Gamble – whose brands include Head & Shoulders (shampoo), Downy (fabric softener), and Gillette (razors) – spent $9.3 billion, or 11.2% of sales, on advertising. The massive budgets allocated to brand marketing are justified on the basis of repeat sales. The idea is that, once a consumer has crossed the Rubicon into being a user of a particular brand, they will purchase exclusively from that brand for some period of time given a barrier to adopting a different brand. This barrier is called, in economic terms, a switching cost – it describes the cost incurred by a consumer in switching from one product to another. Switching costs can take the form of direct payouts, such as when a customer must pay a fee for terminating a contract with a supplier, or indirect additional expenses, such as when a consumer must grapple with the learning curve of a new software product and therefore sacrifices productivity for a period of time. 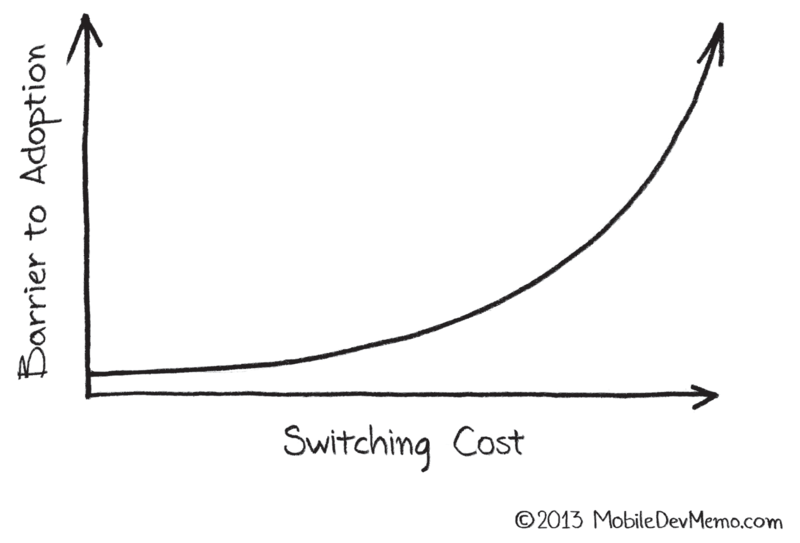 Switching costs can also take the form of uncertainty. For instance, when a consumer has become accustomed to a particular brand of soap, switching to another brand presents uncertainties about that product that must be accepted. Will it smell the same? Will the texture and consistency be the same? Switching to a new product introduces risk into the purchasing dynamic. This risk is usually accommodated for by decreased price: competitive pricing can compensate for product uncertainty and catalyze a consumer’s switch. Switching costs exist at a minimum for mobile freemium products; freemium apps can be frictionlessly replaced both due to a price point of $0 and near-instantaneous distribution. The only cost borne in switching from one app to its competitor is the time required to install the new app and whatever data charges are incurred in that install. The benefits of brand awareness are invalidated under conditions of minimal switching costs: with freemium products, users have the latitude to experience all apps that serve a specific function and settle on those which best meet their needs. There is no uncertainty in freemium – users can know exactly how any app of interest functions without bearing any risk. The lack of constraints in sampling freemium products without risk also allows freemium products to be used in tandem in a non zero-sum dynamic: a consumer can “own” multiple freemium products, even when those products compete, without incurring additional expenditure. This is the essence of freemium: massive scale is generated by a price point of $0 and no marginal distribution costs, potentially exposing the product to the greatest number of people and monetizing those to whom it holds the most acute appeal. Brand marketing is difficult to reconcile with this model, because the immediate and effortless availability of all products abstracts away the concept of a “brand”. The purpose of a brand is to tell a narrative about a company in order to allow for assumptions about its products to be made (usually relative to quality, eg. the quality of a brand’s products in one vertical are assumed because the quality of its products in another vertical are known from first-hand experience). But assumptions are unnecessary under freemium mobile conditions since all apps can be tested without any risk assumed on the part of the consumer. Additionally, the central premise of brand marketing — that switching costs secure repeat purchases from a user that has been “acquired” – is undermined by the freemium model. Since switching costs are minimal for freemium mobile products, the opposite is true: because the only users that will monetize are those whose needs are best met by the product, performance-based, targeted user acquisition campaigns (ie. campaigns that algorithmically seek out those users) will outperform traditional media campaigns. Performance user acquisition is so named because it is capable of being instrumented and tracked, and thus performance campaigns can be evaluated on the basis of return on investment. On mobile, for the most part, each user acquired through a mobile install ad can be attributed to the exact campaign they followed into the app, and aggregating this data allows bid prices to be set profitably (that is, where expected LTV exceeds CPI) in pursuing user base growth. This generally isn’t the case with traditional brand marketing mediums like television, print, radio, etc. 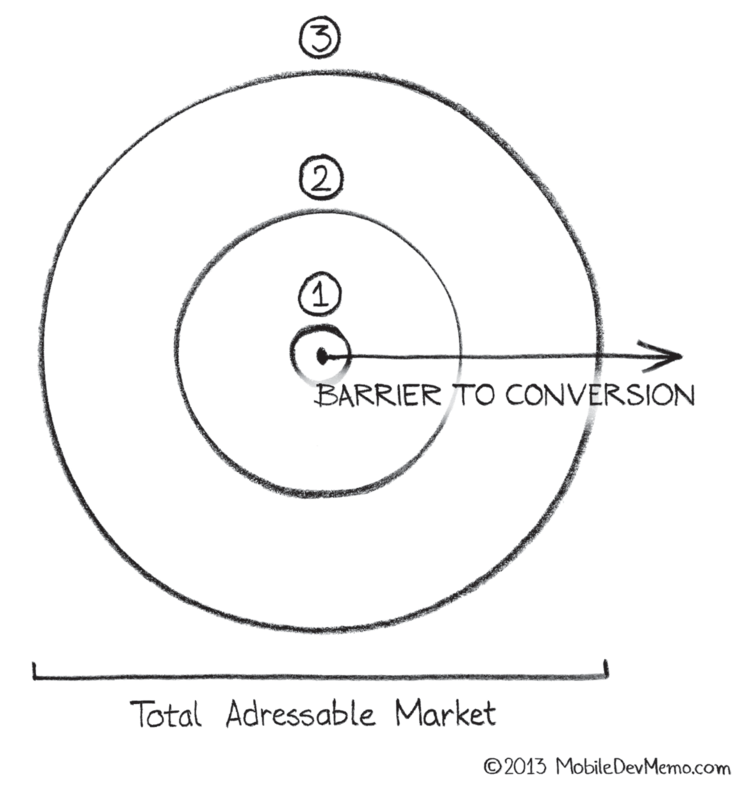 ; although estimates can be made for conversion, tracking users precisely is not possible. This means that setting bids based on optimized targets of conversion rates and per-channel lifetime customer value estimates is not possible with total accuracy. But this doesn’t necessarily disqualify brand marketing as a strategy. Brand marketing channels offer something that mobile advertising can’t: exposure to inaccessible consumers. By definition, mobile advertising requires that the person being advertised to have a phone and, at least, one app installed. Television advertising requires only that the person being advertised to have a television. In the US, the number of “TV homes” – or homes equipped with a television – is 115.6 MM, housing 294 MM people, or 94% of the population. In June, Pew reported that 56% of the US owned a smartphone. People that own a mobile phone and play games frequently (easiest to reach with performance marketing). People that own a mobile phone but do not play games or even use it frequently (difficult to reach with performance marketing). People that do not own a mobile phone (impossible to reach with performance marketing). Reaching the people in groups #2 and #3 is where brand marketing adds value: by allowing a game to reach consumers it can’t through mobile advertising and potentially unlocking additional total addressable market. When a user can be reached through mobile advertising, they should be reached through mobile advertising. But if that user can only be reached through television, and a game’s LTV supports it, television ads can certainly play a productive role in mobile gaming user acquisition. The question, of course, is how many mobile games can justify the substantial cost of television advertising with their lifetime customer value metrics. The answer is not likely many: perhaps a handful of games per year will emerge as broad enough and lucrative enough on a per-user basis to be able to benefit from television advertising. And for the games with such high LTVs, performance marketing will remain as important as ever: for the users that can be reached with a mobile install ad, performance marketing will represent the cheapest and most direct means of conversion. The viability of brand marketing for massive games will not reduce CPI prices in the long term. More likely is that CPI prices continue to rise with LTVs as game developers continually master freemium mechanics, games-as-a-service provide deeper and more meaningful player experiences, and the negative stigma around in-app purchases dissipates. Those LTVs will be drawn against first through performance marketing as the most easily reached mobile users are converted to players; performance marketing is simply the shortest and most economical path to mobile gamers. But while performance marketing will remain the optimal strategy for converting existing gamers, brand marketing will increasingly be relied upon by the largest developers to create new gamers — to build bridges to the bodies of dark matter that exist outside of the current mobile gaming ecosystem. The two forms of marketing will grow in tandem: the rise of one doesn’t suggest the decline of the other. Mobile engagement and usage continues to surge; there’s no reason to suspect that performance marketing will become less strategic because players are becoming more valuable.